The Accumatic line of watches was introduced in 1956 and produced well into the 1970s... a pretty good run for a model line. They typically used ETA-based automatic movements and Hamilton's modern day watches still do. So I suppose you could say that they've been in constant production for over 60 years. In 1961 the Accumatic A-651 was introduced. As you can see in the catalog depiction, the A-651 came with a 10K yellow rip case with a stainless steel back, thus the 65X designation. 6 is for RGP and 5 is for stainless steel. The 1 is the sequence the model was named, there was a 650 before it and a 652 came out later. In 1962 the catalog depiction changed and the stainless steel back was removed. There was also a price reduction, so maybe that was the reason for the change. It stayed this way in 1963. So if you have an A-651 with a stainless steel back, I suspect it would be a 1961 model. 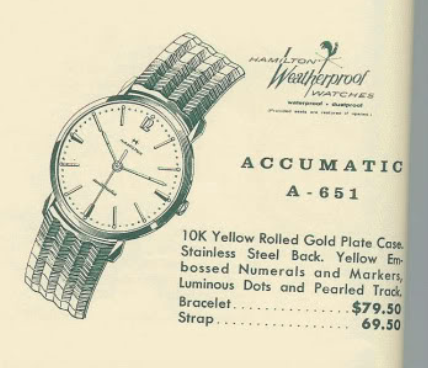 Being a part of the Accumatic line from the early 1960s you would expect to see a Hamilton 689 under the dial. I recently received what I believe to be an A-651 from a fellow collector that was having "stem issues". Most of these models open through the crystal and the two piece stem can eventually weaken and pull off too easily. Although the watch looks unremarkable, upon close observation it appears the lugs on the case don't match the lugs on the catalog image. The hands are luminous, as they should be, but it's hard to say if they're the right style. The arrow tipped second hand is pretty cool looking but it's not clear from the catalog if that's original either. The dial is definitely correct though. The back of the watch isn't stainless but it's clearly a Hamilton case. The "stem issue" looks like it might be a crown issue, as the male side of the stem is engaged but the crown just pulls off. This watch has a 689A movement but it has a male stem inside the movement and the female side goes into the crown - that's a little different than most applications I've seen. Usually the male side is in the crown. The inside of the case has numerous watchmakers' marks inside, so it's been well maintained. Turns out this watch has stem issues after all. Check out the original stem on the left - it has no threads remaining. I'll replace it with the female stem on the right, but I'll have to trim it to length first. Everything is cleaned and dried before being reassembled. With a few turns to the mainspring to re-energize the watch, the balance jumps back to life once it's dropped into the correct place. The watch has a fairly high beat error. Fortunately it's easy to adjust. It took a little tweaking but I got everything to line up just as it should. The performance on the left side of the screen is right on the money. With the watch outfitted on a fresh lizard strap, it looks great in my opinion. The textured dial is a nice detail. I thing the hour hand is a little shorter than the catalog depicts so I bet the hands have been changed. Did it leave the factory looking like this or were the hands and case changed at some point? Who knows? A lot can happen to a watch in 55 years, that's for sure.